All transactions are safe and secure with a reliable history in online purchasing behind each of our associates. Buy the Zombie Costume t-shirt to own Zombieland clothing and merchandise. Want to play golf without being interrupted by zombies? Then take a hint from Bill Murray himself. According to Bill, if you look like a zombie, then you are accepted as one of them and they will not bother you. Woody Harrelson's character, Tallahassee, believes it is innate, similar to how buffalos know to travel in packs. Either way, this tee is for you. 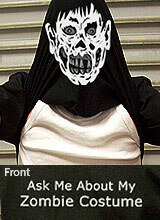 The front encourages people to ask about your zombie costume, and when they do, it can be flipped up to cover your face and display an inner graphic mask. Get this zombie t-shirt now but be careful, someone may mistake you for a real zombie and shoot you. In addition to the Zombie Costume tee above, browse the Zombieland Clothing Gallery for more apparel like men's and women's clothes, kids shirts or hoodies.